Sam had the fish of the day on his line, about a 4 pounder that threw the hook after a couple of jumps. 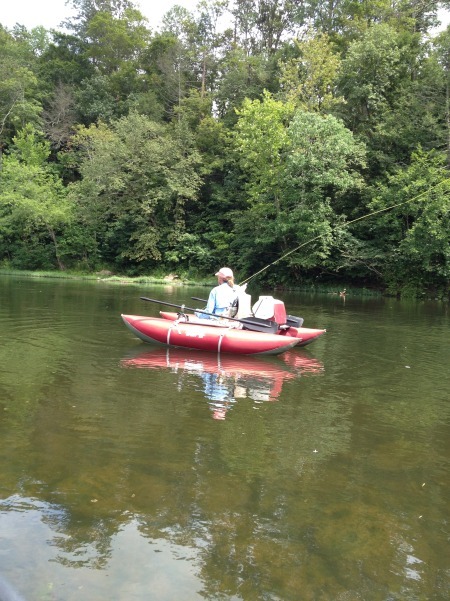 Saturday 7/21, we floated float the Saltpetre to Horseshoe Bend/Narrow Passage section of the James. CSX has put up a barricade on the river side at Saltpetre making it more difficult to get the boats to the river. However, the work was was worth it! Tried a few different flies but settled quickly on the Tequeely again. The James was crystal clear and the yellow legs of the Tequeely pulsed on the retrieve. I got hot early and was catching fish fast, bass and redeyes. We stopped for lunch at the old train bridge abutments. It was interesting as we looked up and saw two of the biggest sycamore trees I’ve ever seen, each looking to be 7 to 8 feet in diameter. Fascinating to think how long they’ve been there. 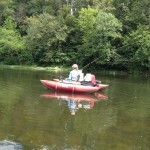 We finished our lunch, and I caught a half dozen bass in a riffle just a few feet away from our stop. 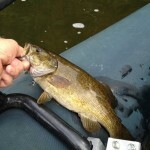 Caught two more as I floated through the same riffle on the boat. After a while, I cooled off and Sam started catching ’em. However, we caught fish all day, one or the other of us. 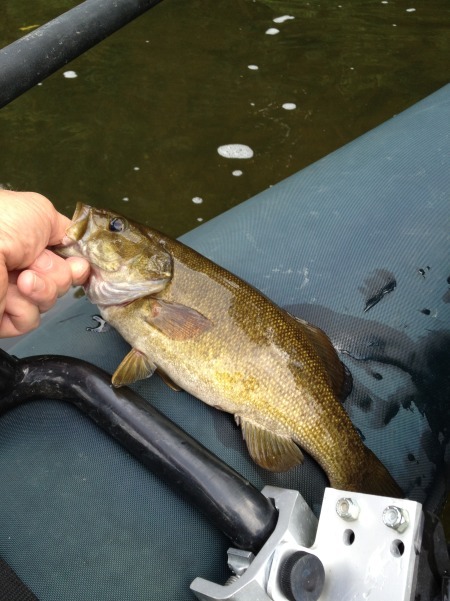 I also landed several 11-13″ fish. 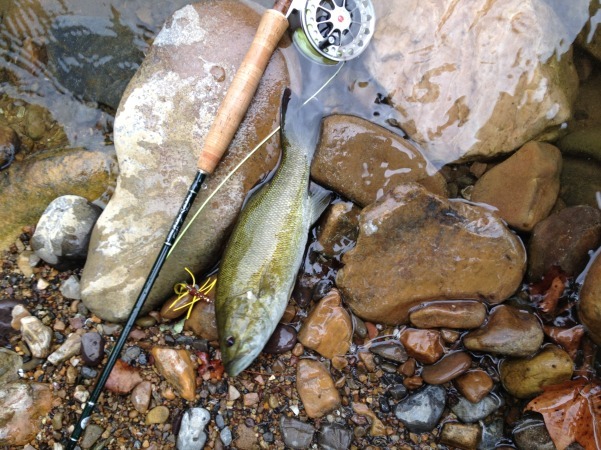 Sam caught a 15″ fish in the last riffle above Narrow Passage that towed him at least 50 yards down the riffle. He also caught many 11-13″ fish. Each of us boated 40 or so bass and that many redeyes as well. A helluva good bass fishing weekend! 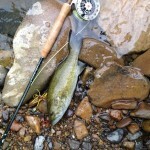 This entry was posted in Flyfishing on July 22, 2012 by joel.